Lenzie try to get an attack going against Glasgow Accies on Saturday. 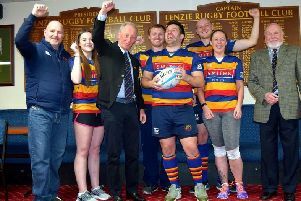 Lenzie went down 46-27 at home to Glasgow Accies in their BT West Division 1 fixture on Saturday. A lacklustre performance allowed a well organised Accies side to achieve a deserved 27-3 advantage at half-time some late call offs and an early injury to the impressive Sutherland clearly affected Lenzie’s performance. Lenzie regrouped for the second period and kept possession for longer periods to put Accies under pressure. Brett, Scouller, Morrison and Condie were all breaking through Accies defence with Patterson and Baldman combining well at half-back. Lenzie scored tries through Patterson (2) and Scouller to claw their way back into the game but Accies sealed victory by scoring an additional two tries when their speedy full-back was allowed to run deep into Lenzie’s territory before linking well with support players. Lenzie continued to take the game to Accies and Morrison made a decisive break and collected his own deft chip to release the supporting Scouller to conclude the scoring. The second period for Lenzie should restore their confidence and self belief for their important league match next week at Viewfield against Kilmarnock whose home game with Allan Glen’s last Saturday was postponed.